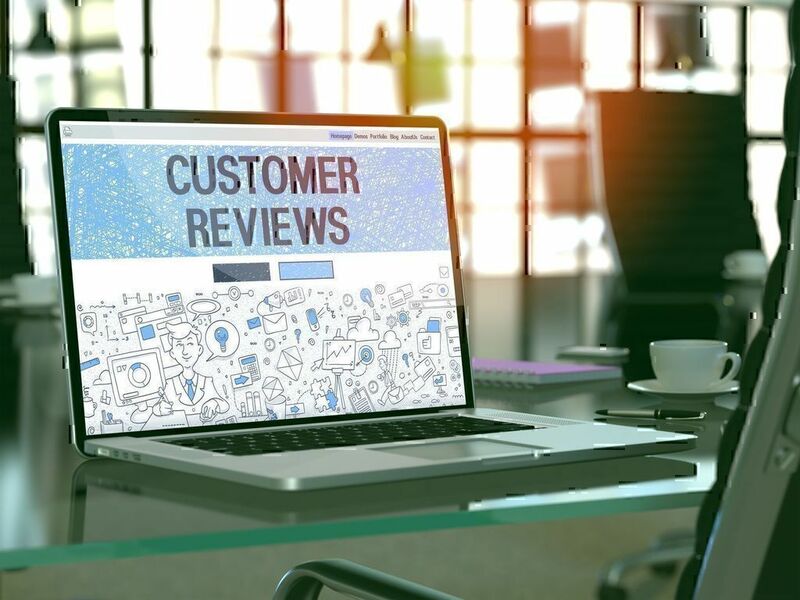 Reputation is a considerable factor that impacts customers' choices. Although it plays a vital role, it is not always taken care of properly. From time to time, lack of professionalism and poor communication appear alongside with brilliant service and reliable customer support. Top complained companies' lists can help improve customer care and avoid future issues. At the same time, such lists provide customers with up-to-date information about potential inconveniences. This is why we present the information of top complained about companies monthly and help our readers to keep fingers on the pulse. February showed some impressive results. 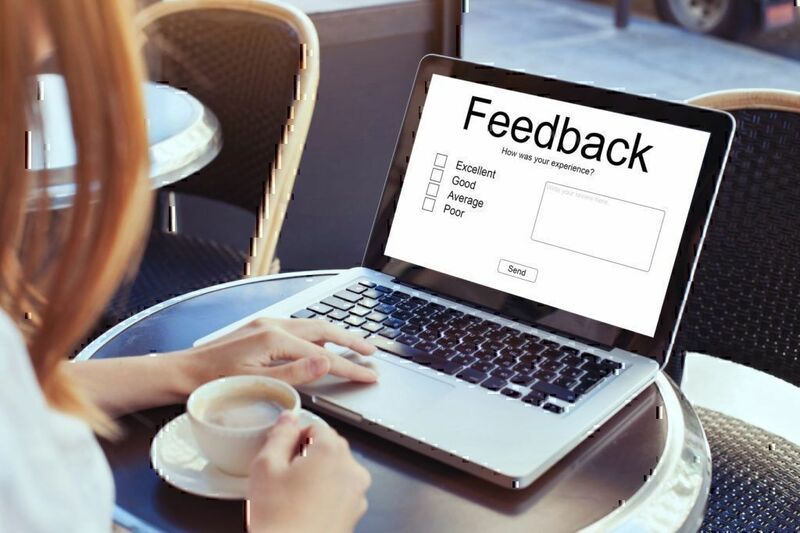 On the one hand, many companies got positive feedback and improved their performance. On the other hand, consumers were pissed about the services of dozens of companies. 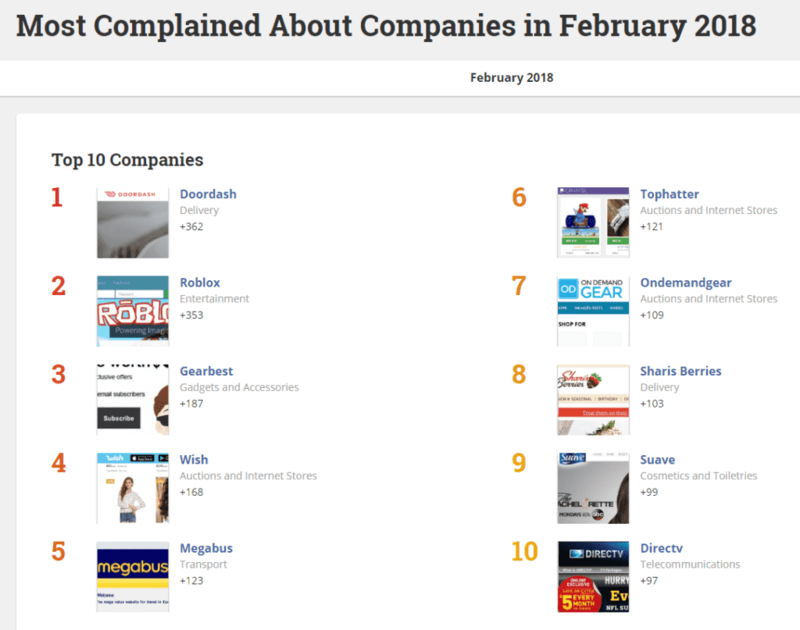 Our list of top 10 most complained about companies is based on user reviews and is presented here for you to compare companies and be aware of all the issues that may arise. Informed consumers are protected consumers. Doordash is one of the favourite services among a lot of satisfied customers. But delivery has never been an easy task. Even though Doordash claims to provide only high-quality and convenient delivery services, apparently, customers are not quite satisfied with them. delivery issues that were never reimbursed. Doordash offers its customers to use their website or application to make an order. But taking into account the described situations, the company has some serious problems with the software support. According to Doordash reviews several orders were automatically cancelled for no reason, the charge was taken but the order wasn't placed, some of the accounts were suddenly deactivated. "...I place my second order with Doordash. My credit card was charged and the "real time" tracking page (which is a total joke) said my delivery could be expected in 46 minutes. I waited for over an hour and wrote a complaint. I continued waiting but my order never came…"
This online gaming platform provides outstanding opportunities to its users. More than 15 million of various games are created here. Roblox is very popular among children and teenagers, but the number of complaints over the past month is impressive. "This morning I noticed three unauthorised purchases made to my credit card…I did not authorise these purchases and am very distressed at these charges..."
This Chinese company is one of the biggest retailers of electronics on the Internet. On their website, a potential customer can order various goods, such as phones, tablets, gadgets etc. The shoppers love this website for its convenience and low prices, but nevertheless Gearbest appears on the list of the complained companies repeatedly. The customers' feedback highlights Gearbest issues with warranty, cancellation, return policy, and credit card fraud. The complaints regarding stolen personal information and fraud were the most common in February. Some of the consumers were even going to get in touch with attorneys and the police in order to solve the most problematic issues. The considerable number of complaints described shipping issues. Some of the purchases were delivered months after they were bought, and Gearbest customer service couldn't help with that. "I purchased an item in mid-December, and two months later, I still have not received it. I contacted customer support, but they did not help…"
Wish is one of the world's biggest eCommerce platforms for online shopping. 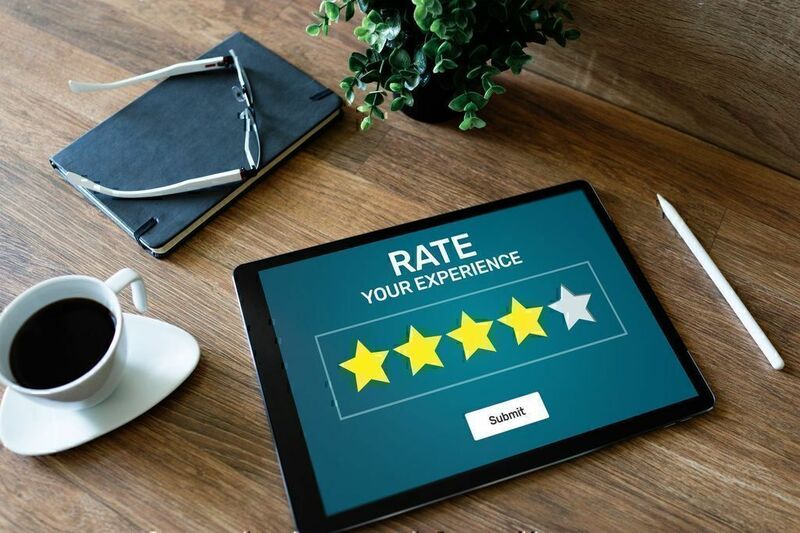 It is used by over 300 million of customers, and it has gained good reputation thanks to years of experience on the market. But in February some shoppers were really pissed off by the service. Complaints describe situations when the company gave false information about the products and refused to make any refund. 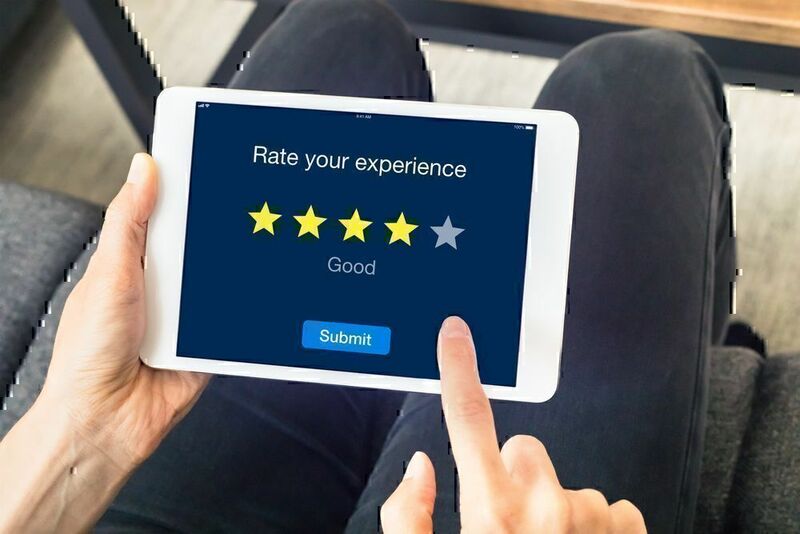 According to Wish consumer reviews, the company demonstrates a low level of customer service and their marketing and advertising campaigns cause frustration. Some of the shoppers highlighted the fact that false advertising is illegal. "Wish has been dishonest with customers,by marketing and advertising items that are misleading, inoperable, counterfeit, used and it is unacceptable! I have been victimized by the false advertisement of their products..."
Additionally, customer support team did not react to all of the complaints. Megabus is a powerful transportation service in the USA. This company offers good services for reasonable prices, as well as additional amenities on the buses and online booking. But just like any other service, transportation can be complained about a lot, too. According to passengers' reviews, the things did not look so great in February. "DO NOT USE THIS SERVICE. They will take your money and leave you stranded..."
This auction marketplace is popular among customers worldwide. Lots of online auctions take place here day by day, and most of them are successful and satisfying for both retailers and customers. But it looks like they had a hard February. Some of the delivered items were of poor quality or even broken, but the money was not refunded. Besides that, the company required its customers to pay for returning products what, in particular cases, was even more expensive than the product itself. False advertising and products that didn't match the ones that had been bid on are among top described problems. Consumers also complained about Tophatter customer service. 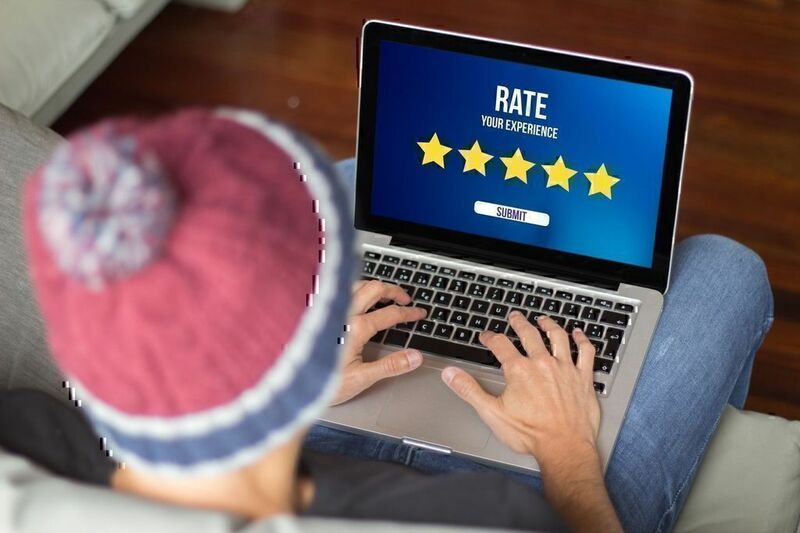 "I loved shopping on tophatter but the fact that you can not contact anyone by phone is bad customer service…"
This Shopify web store had received many positive feedback from customers before. But the company definitely needs to be mentioned when you compare companies that were complained about in February. Reviews reflect some serious shipping and order cancellation issues. "I ordered on Dec. 2nd and emailed several times, no word, no update. No shipment, but money taken..."
Sharis Berries specializes in delicious sets of special desserts. Its products are special and lovely, and attract customers greatly. But it seems like St. Valentine's Day created major troubles for this merchant. According to the feedback, the products of the poorest quality were delivered to some of the customers during this festive period. The company claims to protect the treats from getting wrecked by carefully wrapping them into packages. Yet, as the complaints show, many packages were severely damaged in February. Complaints on Pissed Consumer even describe the situations when Sharis Berries customer service misinformed the consumer. "...The customer service person told me she was going to send me the same 12 strawberries again and another half dozen plus 6 chocolate covered pretzels to make up for the inconvenience… The replacement never came..."
Suave online store successfully sells beauty and style products, mainly shampoos, conditioners, and shower gels both for kids and adults. In most cases, the company provides their customers with good level of services. Yet, pissed consumers pointed out that the quality of their products has decreased recently. The products began to negatively affect customers' hair and appearance in general. Most of the customers blame Suave product quality for their hair loss. Cocoa shampoo and conditioner appear in most of the reviews. And it looks like customers are really frustrated with these products. "I would like to start with an apology to me and my daughter and promised that this product if you took them off the shelf and whatever is in it that is causing these horrible side effects do not ruin other other children and women appearance !!" It is not the first time Directv appears on our most complained about services list. This provider has a lot of consumers all over the USA and has been serving them well over the years. A few months ago, they became the subject of many negative feedback. "We are paying more money to get less service"
Unfortunately, this is quite common on the market nowadays. February complaints demonstrated customers' opinions about various companies and helped to compare companies as objectively as possible. Along with that, PissedConsumer got the data on top categories of most complained about products. Let's take a look at them. Online shopping attracts customers worldwide. It is quick and convenient but nevertheless can be full of issues. In February, delivered products differed from the described ones. Besides, there were issues with product quality and false advertisement. Top reviewed companies: Wish, Tophatter, Ondemandgear. Telecommunications was added to the list of most complained about services because of the poor quality of the services provided. 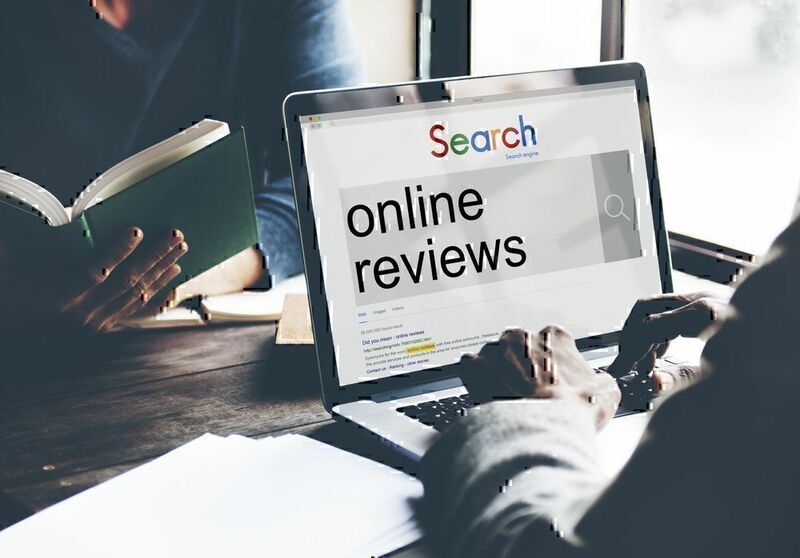 Additionally, fraud and scam situations often appear in their reviews. Some of the February problematic issues have not been solved yet. Top reviewed companies: Directv, Securtel, American Broadcasting Company. This complained about category has a lot in common with Internet Stores issues. Here, we have the information about poor quality of products and indifferent customer service. Top reviewed companies: Fashionmia, Popjulia, Thejstore. Here, customers complained about awful food that didn't not match what was described in a menu. Also, poor customer service was widely spread in this industry. Top reviewed companies: Pizza Hut, KFC, Dominos Pizza. Almost every pissed consumer complained that products from Furniture and Décor category were of extremely low quality. Featured reviews demonstrate photos of terrible products that were delivered, and how badly they were damaged after only a few days of use. Top reviewed companies: Mypillow, Aarons, Acceptance Now. Poor Customer Service. This is nothing new. Every customer has faced problems when reaching out to customer service at least once. Lack of competence and professional training cause a huge mess. Rudeness and unprofessionalism are a quite common practice. Low Quality. No matter what services a company provides, from delivery to selling flowers, poor quality is described in bulk of reviews. Even the most popular brands can demonstrate low quality of their most expensive products. Software Issues. Shopping or making orders online requires powerful software supported by competent specialists. Orders made via websites or software apps tend to be unsuccessful and dissatisfying if these two requirements are not met. Additionally, online shoppers are targeted by hackers, so the level of software security needs to be high. As experience has shown, this issue is often ignored. Any company or service has its strengths and weaknesses, so consumers may have both positive and negative experience from time to time. We believe that this list of top 10 most complained about services will help you avoid potential troubles in the future and keep you safe from falling victim to a scam.